The next phase of this project continues with workshops led by program volunteers as the Urban Weaver Studio. See new website for updates and current events. Contact us through this new email, as email from the project is no longer being monitored. Hope to see you all, weaving! Join Us at The Urban Weaver Project at the corner of Heatley and Keefer Street in the Maclean Park Fieldhouse. help celebrate the works made and the community of weavers we have forged. 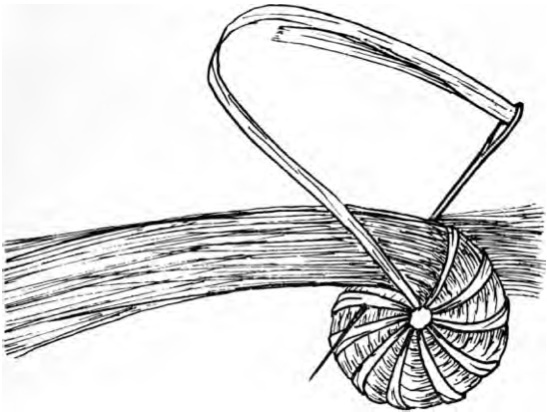 There has been much success with the coiling weaving technique. Many of the beginner weavers found that this simple technique, the least difficult to learn. 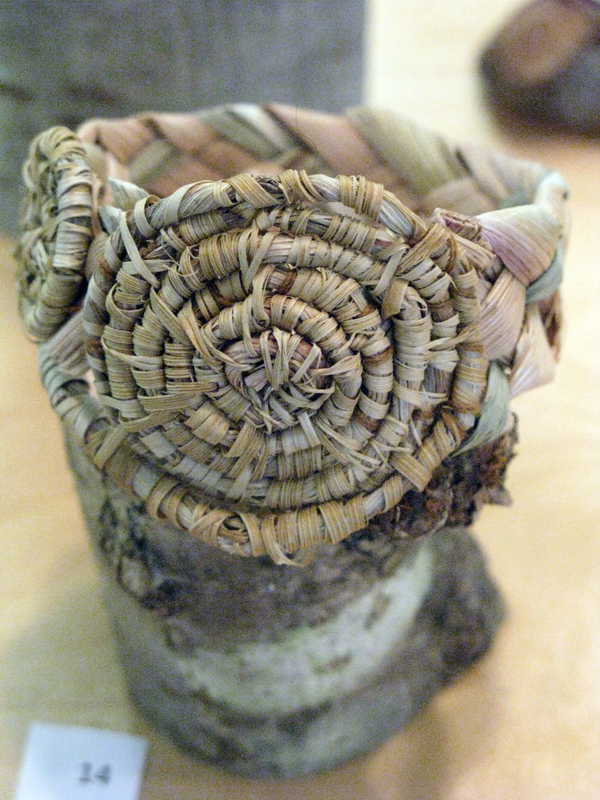 After one or two fiddlehead bases had been made, and sufficient confidence had been acquired in handling the material (in most cases, English Ivy and Raffia), beginners went on to make beautiful small baskets of pine needles with black berry vine skin, english ivy with split english ivy, large skeps as natural bee hives using canary grass and fishing line. The list can be endless. 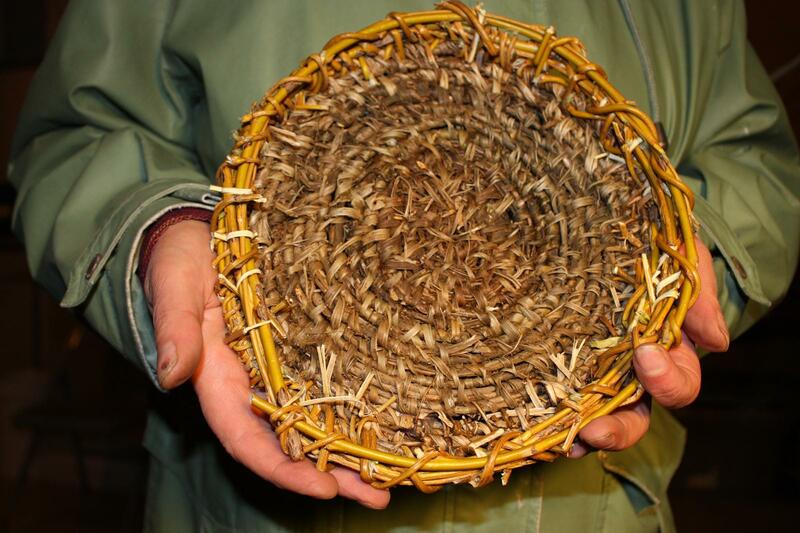 Some great YouTube Videos on skep making. How do you identify Flag Iris? Height and Stem: Up to 1.5m in height. Stems are green, hard, oval shaped stems support flowering and fruiting bodies. Leaves: Narrow, flat, erect, and pointed at tip, arising in a fan like cluster from base of plant. Dark green and numerous. Flower and Fruit: Flowers large, showy, and yellow. Sometimes have brown to purple veins at base of petals. Seed pods green, large (up to 8cm long), and numerous, arising from top and side of stems. Large 3-angled fruit capsules containing rows of numerous flattened brown seeds that float. Grows in a variety of fertile, low-lying wetland habitats, including river banks, ponds, lakes and marshes (both freshwater and saltwater). How do you harvest Flag Iris and when? Remove entire rhizome root system with leaves and flowers (i.e., late spring to late summer). Re-visit sites in subsequent seasons, if intent is to terminate its spread. Minimize disturbance during removal. 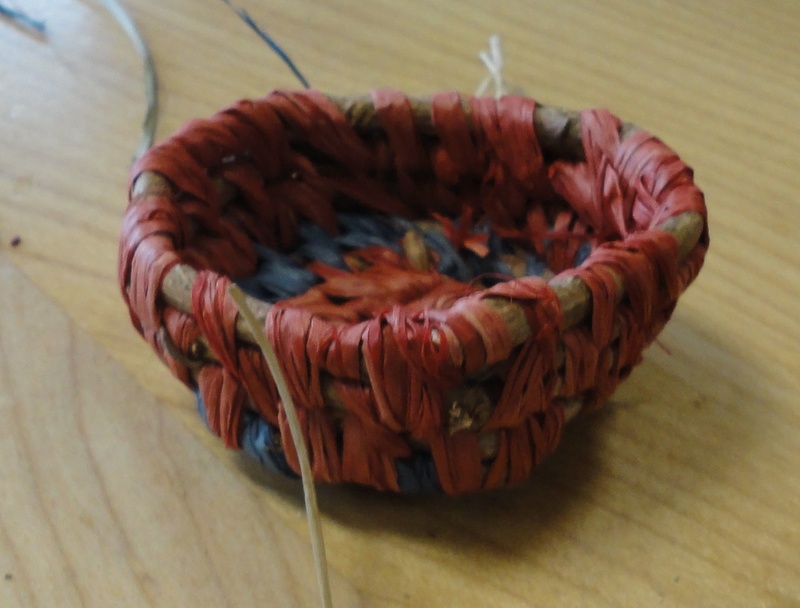 The leaves can be used for braiding or coiling and produces a green dye, the roots for a black or brown dye, and the flowers for a yellow dye. Wear gloves and appropriate clothing. All plant parts are poisonous because of the resinous substances in the leaves and rhizomes which can cause skin irritation. Dry the leaves in bunches handing from a clothes line or from pegs on a wall. When dry, the leaves are less irritating to the skin. 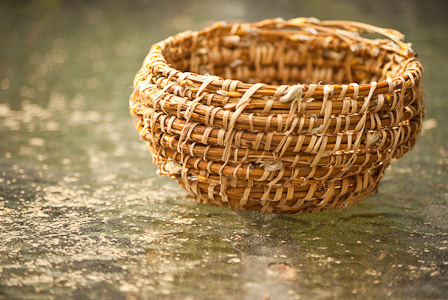 Leaves do not need much soaking in lukewarm water before starting a weaving project. Leaves may be rinsed in the shower or bathtub to soften enough to bend and put in a small bucket. Once leaves have been soaked they can be split into various widths before braiding or twisted together to resemble rope for coiling. Leaves and root rhizomes should be discarded in garbage after removal or use. 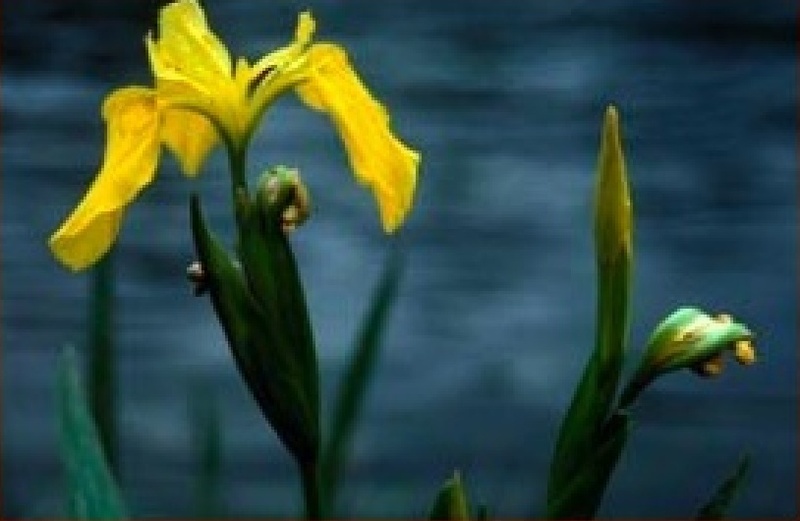 If using, it’s best to dry and keep away from wet soils as Flag Iris can re-root from rhizome cuttings/pieces. Place flower, seeds, and rhizomes in a sturdy bag and dispose of in garbage or through burning. The seeds in the seed bank can re-sprout from disturbed areas where removal of rhizomes has occurred or in the compost pile. Stanley Park Ecology Society (SPES) – History of invasive plant management in Stanley Park. Management of invasive plant species by SPES in Stanley Park started in 2004 through the establishment of the Ivy Busters program. In 2011, SPES re-mapped the invasive plant species in Stanley Park with funding from the Vancouver Park Board (VPB) and help of volunteers. The VPB also supports SPES with tools and the pick-up and disposal of invasive plant material removed. This common invasive plant of Vancouver (BC, Canada), can grow up to 30m with support. The stem is light brown, having holdfasts, and becoming thick when climbing.The roots and stem can reach lengths of over 50 metres in length covering a forest floor. Leaves can be described as alternate triangular juvenile leaves with 3 to 5 lobed, adult leaves ovate and unlobed, dark green, and waxy. To help identify these vines, look for small, green-white flowers form in the fall at the ends of stems on vertical growth and hard blackish berries form in spring, offering a high fat food source for birds (the likely carrier for spreading this plant globally). Vines stripped of leaves and rootlets. The longer vine the better, which are used for weavers or warps when twining or braiding. Shorter vines are good for warps and small coiling projects. Any Time. All year around. Twining, coiling, and braiding, in the making of twined utilitarian baskets, trivets, trays, coiled baskets, coiled mats for example. Tools for ivy removal are: work gloves, pruning shears, lopping shears, pruning saw. So you don’t loose your tools in the ivy, paint handles red or wrap handles in red tape. When gathering the vines can be pulled out by hand with some difficulty. Wear gloves when stripping off leaves and rootlets, and coil for transportation. If you’re clearing the area of this plant, dispose of the leaves and roots in your regular garbage (not compost) to prevent further spreading. Cut climbing vines at a reachable height to remove upper portions. Use the pruning shears to cut and snap the vines away from tree trunks. You can also create ivy logs by pulling up and rolling ivy into a log. This work is best done by two or three “pullers” in an ivy desert where there are few native plants, and you plan to make lots of baskets. Coiled bundles of English Ivy can be used as is, or cleaned of the outer bark, split and split again. If you’re planning on weaving with the ivy at a later date, and would be good idea to clean the bark off, split. Processing the vines for one hour, will result in one hour weaving on average. Coil the bundles so they can fit in a small container (to rehydrate later when you are ready to weave), layout on a table or other flat surface to dry. Or to save space, string coils and hang on a clothesline. Always set your material out to dry after a weaving session, and resoak for the next session. Vines may mildew after lengthy exposure to dampness. Hang the coils in a dry, protected area. Ivy foliage is capable of inducing an allergic reaction (contact dermatitis) in some people. People with this condition are also likey to be allergic to carrots, and other members of that root vegetable family. Avoid contact with eyes. This month we see a few of the weavers using the twining technique, and a couple using the coiling technique. The weavers first names are included to give credit where due. 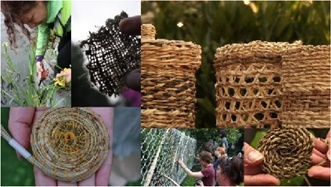 Many participants at the Urban Weaver Project have explored the potential of English Ivy and here is a brief description of the process of harvesting, drying, soaking and weaving. English Ivy (Hedera helix) is an invasive plant here in Vancouver parks and its usefulness has been underestimated by the fact that it is a weed that spreads quickly and overcrowds indigenous vegetation. Harvesting English Ivy for weaving can be done essentially at anytime of the year. Bundle vines or coil up after removing soil, leaves and small roots and twigs. Store in a cool dry place until your ready to start processing the material for weaving. Processing the English Ivy for weaving can be a tedious process, but rewarding. The process is similar to the cleaning of spruce roots or cedar roots. Before you start to clean off the outer bark of the bundles of roots or vines, soak them in a tub of water overnight, then the next day drain the water and you can start cleaning the bundles. Use a knife to clean off the outer bark leaving a nice white material like shown in the Spider weave picture on the right. Bundle or coil these cleaned vines and arrange such that they dry before storing or starting your weaving project. 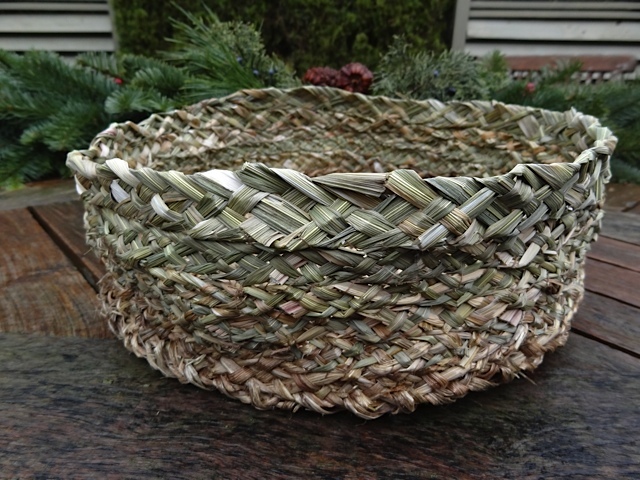 The last picture here shows a finished English Ivy basket, with 3 different colors. Two are the result of a commercial dye, green and red. Without a presoak in a bath of Alum, the colors turned out a little pastel like. The red appearing more orange. Method for dying English Ivy. Presoak cleaned material in a bath of Alum water. Use a canning jar, and place in 1 Tablespoon Alum, and the material you wish to color. Top up canning jar with boiling hot water and let stand covered overnight or several days. In another canning jar, place about 2 tablespoons of color fabric dye and 1 tablespoon of Alum. Take out the material that was soaking in the Alum bath, and put into the new canning jar. This will become the dye bath. Top up the dye bath jar with boiling hot water and let stand overnight in a warm location covered or for several days. Remove material from dye bath, and rinse under cold water. Lightly dry by damping with paper or cloth towel. Tools and Supplies for weaving with English Ivy are few and inexpensive. When harvesting a good pair of garden gloves are handy to keep your hands scratch free. A small knife or utility blade for cleaning the bark off the vines. A bucket or two large enough to soak the vines in. Boiling water from a kettle or hot water faucet is good for softening the vines prior to weaving. A sharp pair of scissors for trimming and cutting the vine as you weave with it. and Some clothes pins to hold your weaving together throughout the project. To dye the ivy vines different colors you will need a couple of wide mouth canning jars, tongs, plastic gloves, tintex or dyx fabric dye, alum powder (from the spice rack at supermarket, used in pickling too, but cheaper from a craft store). 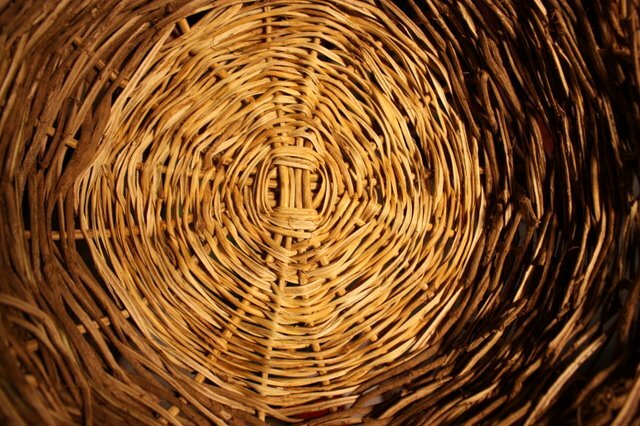 You can buy processed basketry materials from various sources. But for practicing, nothing is easier to obtain than our persistent pest, invasive English ivy. . .
English Ivy; its invasive behavior has given it a bad rap. A while ago I started to feel empathy for the plant and wonder what kind of relationship I could begin to have with the plant, other . . .